Another old time favorite is this snowman. 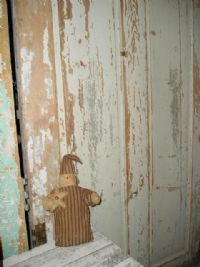 He has an open red aged flannel coat and cap, and a warm green wool scarf around his neck. Sweet huck stems are just the right finishing touch for this snowman. 15" weighed to stand. 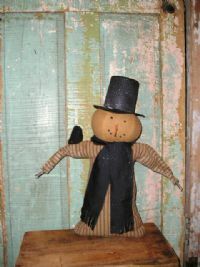 Our snowman is wearing a red ticking coat with a large black top hat. He has his black crow sitting on his arm. weighed to stand 18"
This little guy is from our "willie" line of smaller snowmen. 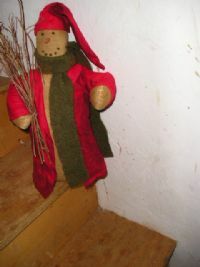 He is wearing a red ticking coat and cap, and holding a star. Weighed to stand. 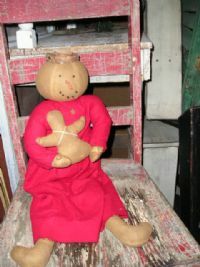 8"
New to our line is this sweet snowgirl in an aged red flannel gathered dress. She is holding an aged flannel angel. sits 14"
He is just another great snowman added to our Willie line. 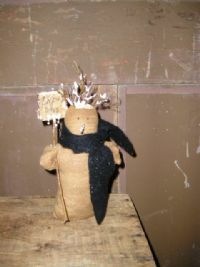 8" tall with a black wool scarf and snow twig hair with a sign that reads "Snowy Days". weighed to stand.